Who misses school and how much does it matter? Almost all Madison Metropolitan School District (MMSD) students have at least one excused absence in each year between kindergarten and third grade, and roughly, half of students in each grade experience at least one unexcused absence. Children with unexcused absences fare far worse in school than those with excused absences, but for the most part the differences in their learning outcomes are not simply due to missing school. 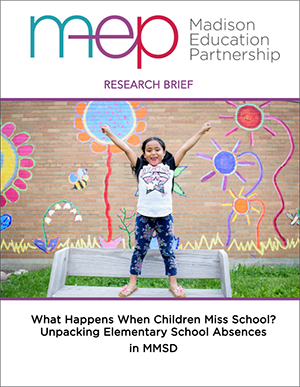 In the latest study released by the research-practice partnership between the University of Wisconsin–Madison School of Education’s Wisconsin Center for Education Research (WCER) and MMSD, the Madison Education Partnership (MEP), finds that absence patterns vary widely among student groups. “Our data show that unexcused absences vary substantially by family income, race and ethnicity. Unexcused absences are more prevalent among African American students, Latinx students and students from low-income families,” states Eric Camburn, a co-director of MEP, WCER deputy director and a UW–Madison professor in educational policy and analysis. MEP reports that excused absences from school – where schools have received a phone call from a parent or guardian and approved the reason for a student’s absence – have little impact on the reading and math progress or socioemotional learning gains of kindergarten through third-grade students in MMSD. According to Eric Grodsky, a co-director of MEP and UW–Madison professor in sociology and educational policy studies, “These patterns matter, but not necessarily as a result of missing instruction. Unexcused absences may be more of a signal about other challenges facing these students, such as poverty, or a reflection of how schools respond to unexcused absences, rather than a cause itself of inequality in academic achievement.” If so, reducing absences may do little to improve student achievement. “We will continue to focus on helping all of our students get to school every day, ready to learn, as well as broaden our focus on attendance to address the root causes of absences,” says Leia Esser, director of student physical, mental and behavioral health in MMSD. "Ultimately, we need kids in school to be able to influence and support their ongoing growth as academic and social-emotional learners and as vital members of our community." The Madison Education Partnership is a research-practice partnership between the UW–Madison School of Education’s Wisconsin Center for Education Research and the Madison Metropolitan School District. Its collaborative mission is to engage in and support high-quality, problem-based research, contribute to policy discussions based on its research and regularly share new knowledge to improve the experiences and individual outcomes for all district students. The partnership engages UW–Madison researchers and faculty; district administration, teachers and staff; as well as stakeholders from the broader Madison community to support the development and use of high-quality, relevant and timely research.